Not to be confused with Exchange ActiveSync or ActiveX. 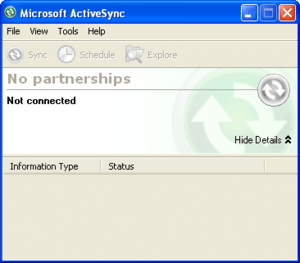 ActiveSync is a mobile data synchronization app developed by Microsoft, originally released in 1996. It synchronizes data with handheld devices and desktop computers. In the Windows Task Manager, the associated process is called wcescomm.exe. ActiveSync allows a mobile device to be synchronized with either a desktop PC or a server running a compatible software product including Expresso Livre, Microsoft Exchange Server, Atmail, Axigen, Horde, IceWarp Server, Kerio Connect, Kolab, MDaemon Messaging Server, Novell GroupWise, Tine 2.0, Scalix, Zarafa, Zimbra or Z-push. On desktops, ActiveSync synchronizes emails, calendar, contacts and tasks with Microsoft Outlook, along with Internet bookmarks and files. ActiveSync does not support all features of Outlook. For instance, contacts grouped into subfolders are not transferred. Only the contacts which are not in a subfolder are synchronized. In case of Exchange Server, only emails, calendar, contacts and tasks may be synchronized. ActiveSync also provides for the manual transfer of files to a mobile device, along with limited backup functionality, and the ability to install and uninstall mobile device applications. Supported mobile devices include PDAs or smartphones running Windows Mobile, Windows CE, or BlackBerry 10 or iPhone but not the older BlackBerry versions, Palm OS and Symbian platforms. Windows Phone 7 doesn't support desktop ActiveSync synchronization. Starting with Windows Vista, ActiveSync has been replaced with the Windows Mobile Device Center, which is included as part of the operating system. Faster, simplified, and vastly improved. Get Connected Wizard's interface modified slightly. Fixed reported bugs with Windows Explorer and XP Firewall integration. Circumvents XP Firewall prompts that users experienced with other program versions upon first run. Removal of on-personal area connectivity options from the synchronisation mix. Users of Microsoft Exchange 2003 Service Pack 2 with devices running the Messaging and Security Feature Pack for Windows Mobile 5.0 will benefit from the following feature enhancements included in ActiveSync 4.5: Direct Push Technology, local device wipe, and certificate powered authentication to Microsoft Exchange. ↑ "Exchange Server 2007 Support for Mobile Devices". Microsoft Exchange portal. Microsoft. 27 March 2007. Archived from the original on 1 May 2008. Retrieved 20 November 2012. ↑ Lein, Adam Z. (17 September 2010). "How to Sync Windows Phone 7 with Outlook". Pocketnow. Retrieved 20 November 2012. ↑ Snyder, Derek (2006). "Windows Mobile Enterprise Features" (PDF). Mobile & Embedded DevCon 2006. Microsoft. Retrieved 20 November 2012.